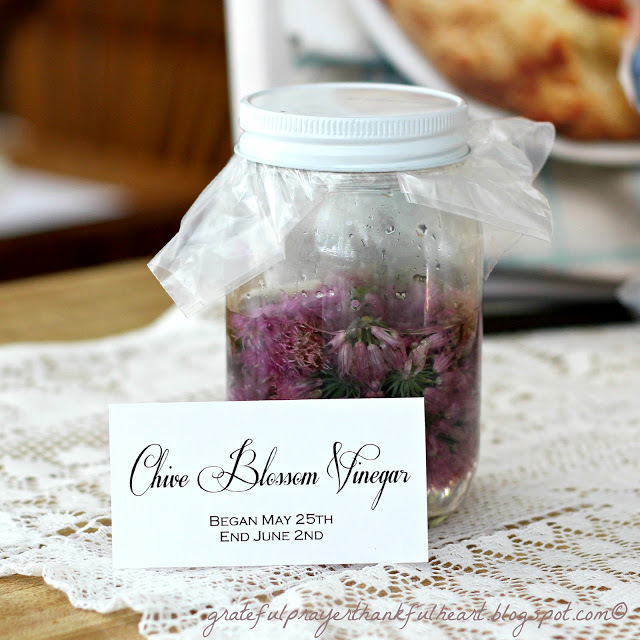 My blogging friend, Lynn @ Happier Than a Pig in Mud recently posted a photo tutorial for making Chive Blossom Vinegar. Since my herb garden was abloom with pretty purple blossoms, I was excited to make a batch to use when I make salad dressing. The process is pretty simple. Gather the blooms and wash gently. Cover blossoms with distilled vinegar. Cover jar and allow to steep 1-2 weeks in a cool, dark place. Lynn said her Chive Blossom Vinegar was just right at 8 days, so that is how long I steeped mine. Strain the vinegar and store in a sterilized jar. Thank you, Lynn, for sharing! Thank you so much for stopping by my blog! Thank you for your words for me! I really appreciate this!!! many many blessings!!! Thank you for stopping by my blog today… it was such an encouragement to have you return. You have a beautiful blog. Fresh and crisp… and your photography is fab. I have always wanted a good camera and to learn to take photos. I am still practising on my Samsung (not expensive) camera. Now and again, I capture a lovely photo (at least I think it's lovely – it may not be in the eye of a trained photographer)! I just planted some chives! Not sure if I have the courage to try something like this but yours turned out great! Beautiful pictures as usual! Love coming here and looking at them! 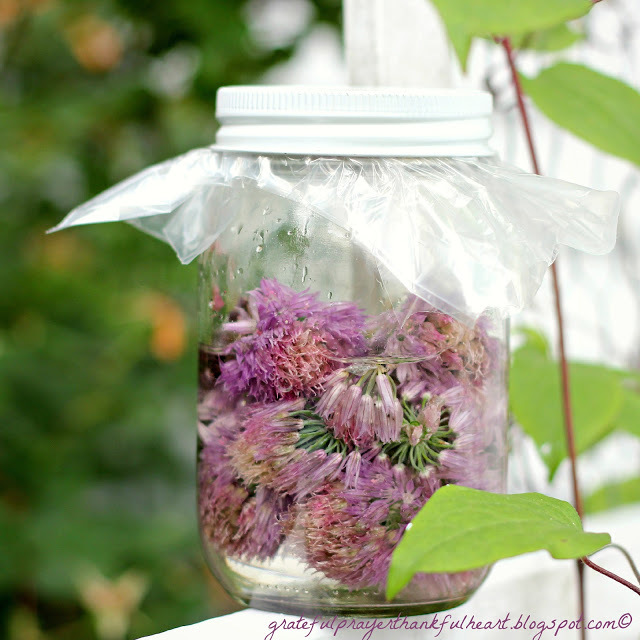 This was on my To Do list this year after seeing it last year on blogs, but I think I missed the chive blossoms again! It is absolutely stunning! I bet it tastes fabulous too. Your pictures are so pretty, such a lovely idea! And Thank YOU also for sharing this wonderful recipe! Your photos are beautiful!! I wish I had chives…. The bottle looks so cute!!!! I love things like this. They make a great hostess gift. Wow – thank you for posting this. As always your photos are wonderful! What would you use the vinegar for? It is so pretty, I love the color! Can't wait to try this!! Thanks for sharing!!! The vinegar looks so pretty. I bet it tastes wonderful. Oh wonderful photos!!! I really enjoyed each of them, you and yours look all gorgeous!!! This looks great and such pretty photo's too! 'Something' ate all my chives so I will have to wait until next year! Hope I get more to plant! But you Chive Blossom Vinegar is lovely and I'm sure it tastes great, too! The best flavored vinegar I have ever had was wild huckleberry vinegar ~ I could drink that stuff straight! :~} The possibilities must be endless! Love the photo with the bottle and daisies! You have such a talent for making your befores look almost as pretty as your afters! 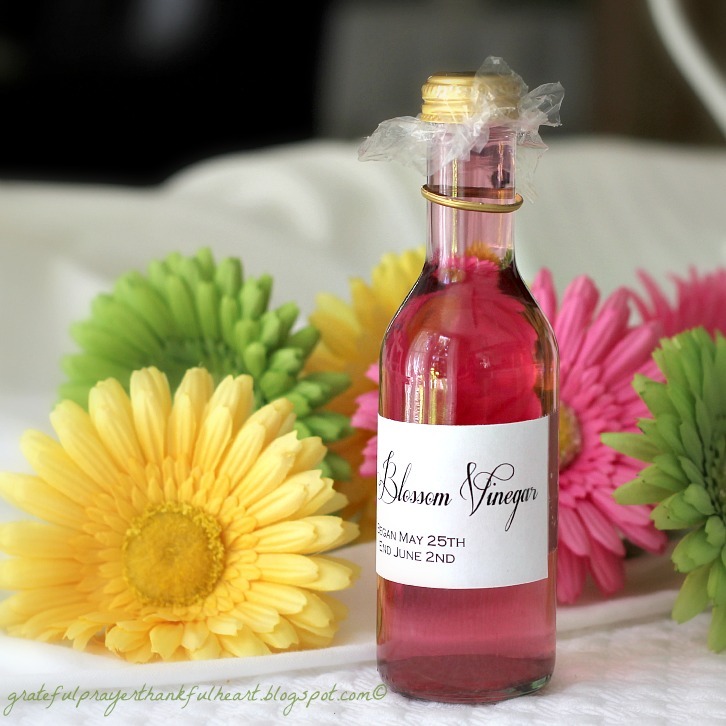 I'm sure your yummy vinegar will be enjoyed and appreciated all summer long. This chive blossom vinegar has such a beautiful color. I would like to try making it too. Great photos! Your pictures are so pretty! A fun and delicious project and your photos are amazing! 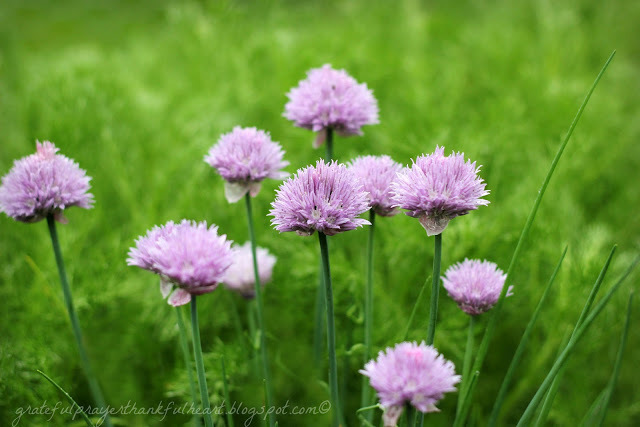 Thanks for sharing this recipe, and link, LDH, my chives will be ready soon and I will just have to try this! Read your last post, a beautiful wedding,best wishes to the lovely couple. Beautiful memories and family photos to be cherished!